Model T Ford Forum: Surely this was an absolute bargain? Surely this was an absolute bargain? Model T Ford Forum: Forum 2014: Surely this was an absolute bargain? Apparently belonging to a previous president of the club? 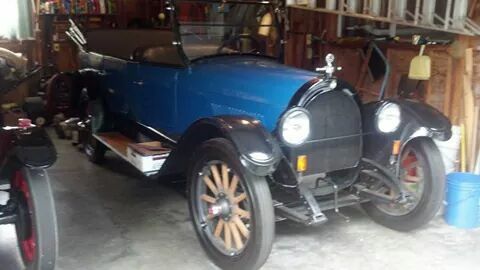 Does anyone have any information regarding the history of this car? I'd agree it was a bargain at that price. So many "improvements" and "upgrades" probably turned off some would-be buyers, but I didn't see anything that couldn't have been returned to the stock components without much trouble. Someone got a good buy. Yes someone got a good buy. The wire wheels look good on there. I could live with the wire wheels and maybe even the color but not the white walls! Makes u wonder if it really sold. Says sold right on the photo, so it must have. As Mike said, it looks like the unfortunate alterations could be fixed without too much trouble. Apparently the deal included at least three correct wheels. It was those turn signals! Someone made the same mistake with my Oldsmobile. I like safety but not if it's the first thing your eyes go to looking at front of your car. HEY!< White walls add class to any car! They look great with the brass! I think this 15 was owned by the late Fred Thomson and the engine has mods to it that another Oklahoma City club member likes to provide. Other then Fred owned the car for a lot of years and he will be missed that is all I know. So in the picture posted on Dec 8, it said "sold". But in the picture posted Dec 9, it said " ended". What is the difference? I went to the the ebay advance page, the final price is in green indicating it was sold. I then checked a couple of other T's that were sold, they too had the "biding was over". If the seller had stopped the auction early there would have been a note in the listing saying so. Mark for sure the car is definitely sold! Mike do you by chance know the members name that rebuilt the engine?